I’m not sure why the idea of a Mario Bros themed bedroom ONLY just came to me…. because both of my boys are HUGE Super Mario Bros fans. I also used to be a giant Mario fan myself! I remember desperately wanting a Nintendo 64 when it came out and when I got it, I was so thrilled. I’d play Mario Bros every day after school and it was was a big escape for me – school life wasn’t the greatest! One thing I’d always wanted but never got though, was a Gameboy. So, that’s one of the first computer consoles I bought my first son, despite the older consoles being a thing of the past. From there on – a new Mario fan was born and we’ve been enjoying Super Mario games at home again ever since. 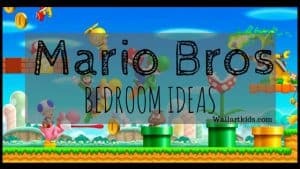 So, as usual with these posts, I’m going to share with you some Mario Bros inspired bedrooms that I’ve discovered and then show you some of the products that you can buy to help create your Mario themed bedroom! 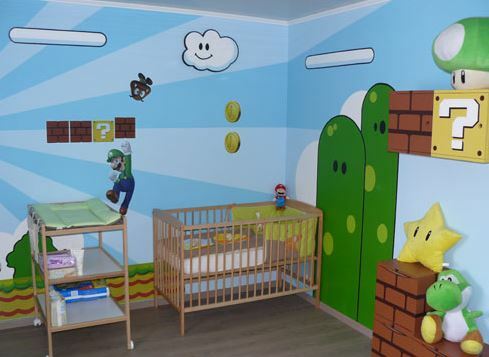 – a selection of Mario Bros Themed Bedrooms. This is incredible. While there is no explanation here for how this room is created, some of it definitely appears to be a DIY project. For example, you would need to create the 3D boxes. But there also seems to be use of Wall Stickers and Mario accessories. You can get Mario wall sized murals, which look amazing. If you want to create a full on feature wall, it might be something you want to consider. Check out a selection here. This look was created with plenty of DIY elements, combined with wall stickers and Mario Bros accessories, such as Mario Plush pillows, which you can see further down in this post. You can see how this look was created via the link above. 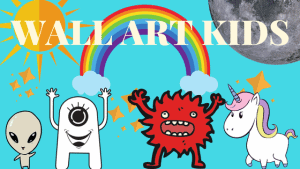 You can find a tutorial how to create this ultra cute bin above. It’s a cost effective way of making a great little prop for your room and would not take much effort! A decent one to try if you’re a DIY novice. I love these shelves – what a great addition these would make! The best part is – these are easy peasy lemon squeezy to create – and all on the cheap from IKEA! See the link above for additional info. 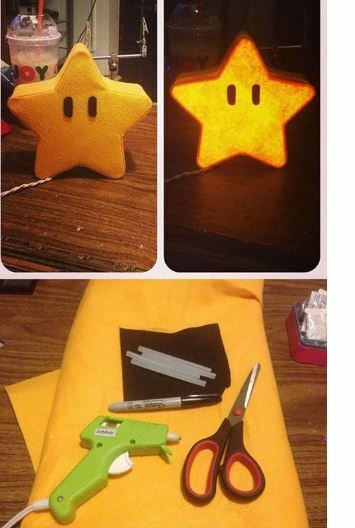 This Mario inspired star light was actually created to go on top of a Christmas tree! 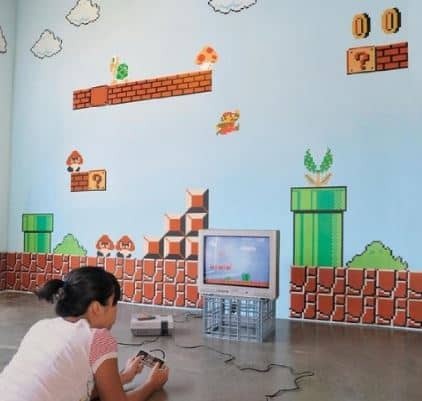 However, it could just as easily be created as an addition for you Mario Bros bedroom. Check out more details in the link above. 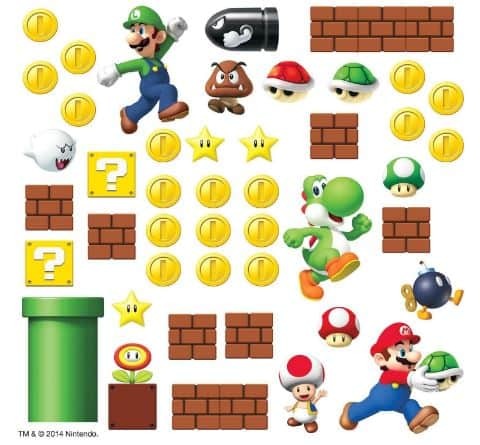 This is a fantastic selection of Mario Bros wall stickers, perfect for getting started with your themed room. They’re really simple to apply, by just peeling and sticking! They’d be great fun to apply with your child too, so they can get creative by creating their own Mario scene. Mario Wall Sticker Selection Here. Another great selection of wall stickers, you can create your own impressive game scene. Choice Of Mario Bros Stickers Here. This absolutely has to be a must have item, if you’re going for a Mario Bros theme! It also plays the coin sound :). This light can be powered by batteries or USB. 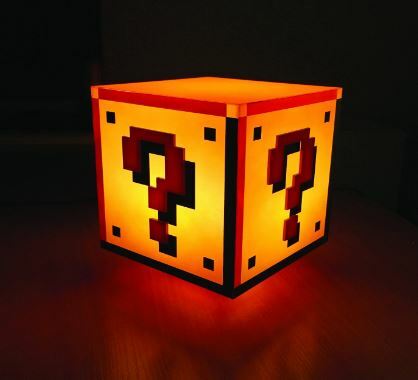 Check out the Mario Block light! 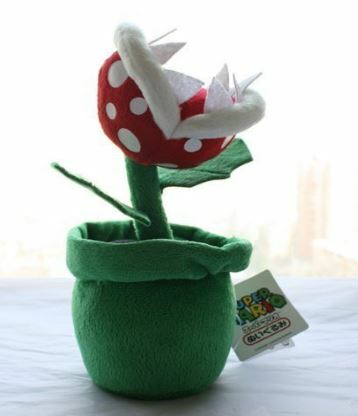 This is awesome – I always loved those scary Mario plants and they’re so iconic – they just have to feature in your themed bedroom! 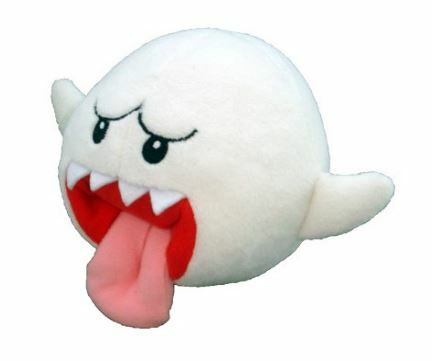 Gather a collection of different Mario plush toys, it’s an easy way to emphasise your theme. I’m adding a couple more of my favourites below! 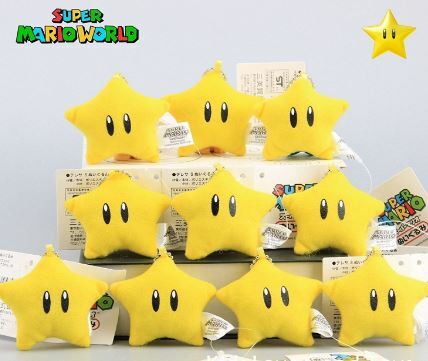 A really cute selection of Mario Stars, these would look great dotted around your Mario room. 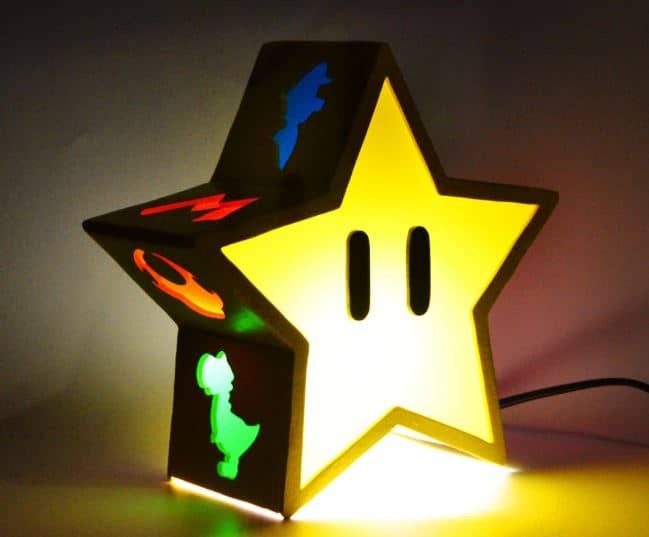 A unique handmade item from Etsy – A Mario Star light, with other characters and object silhouettes surrounding the sides. Made from wood and painted with acrylics. 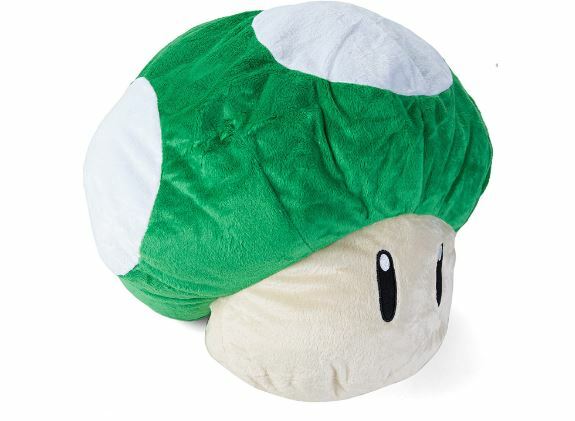 How cute is this little Mario Bros mushroom cushion? You’ll recognise him as the 1-up mushroom, which always a welcome sight to say in the Mario game! 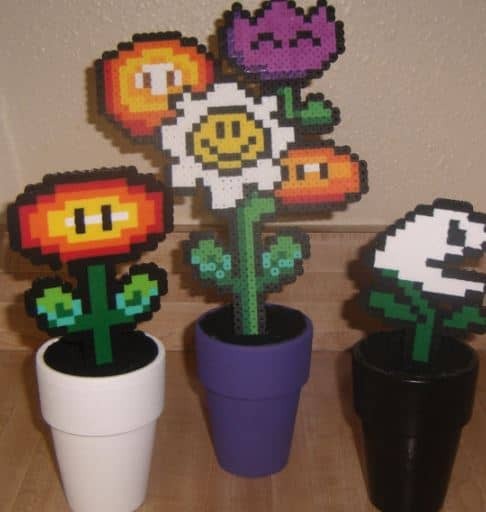 These Mario plants are really unique. They’re handmade from various beads and sitting in a terra cotta pot. You’re in luck, as these can be shipped worldwide too. 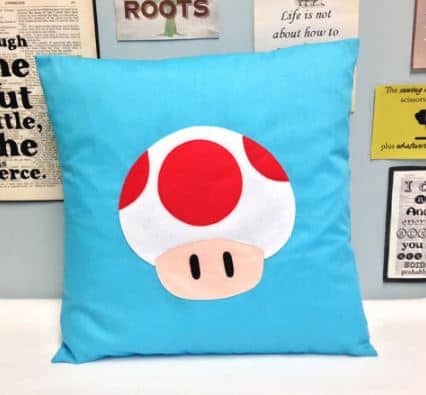 An adorably cute little mushroom cushion. 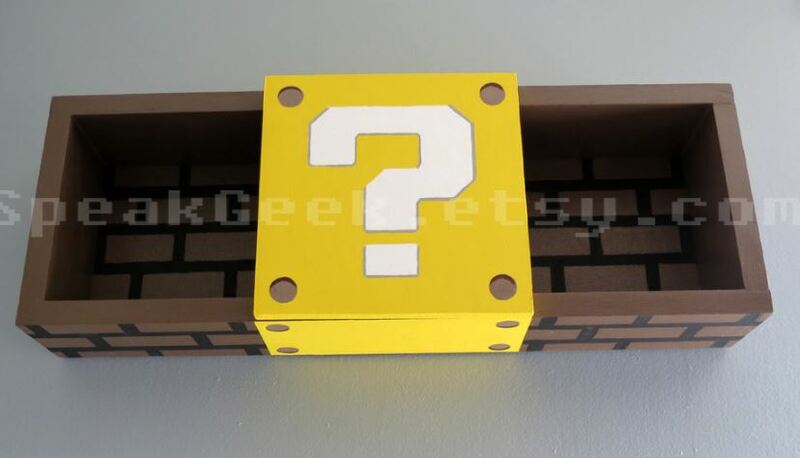 At the time of writing, there is only one of these Mario shelves available, but there may be the option to have one custom made, if you contact the seller directly. This item is only available for shipping within the USA at the time of writing. Check Out Mario Shelf Availability! 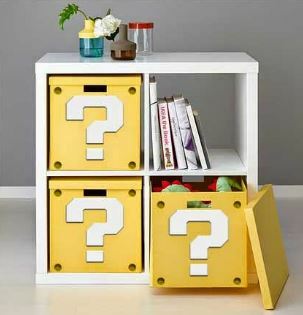 You may also be interested in how you can create your own DIY Super Mario Shelves here. 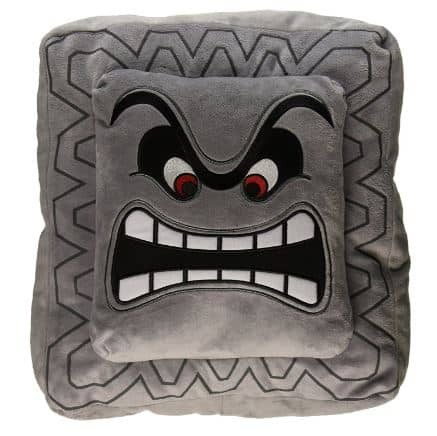 This is an uber cool Mario cushion – You might remember these guys from Mario, the large blocks that fall and squash you! They weren’t originally seen until Super Mario Bros 3. 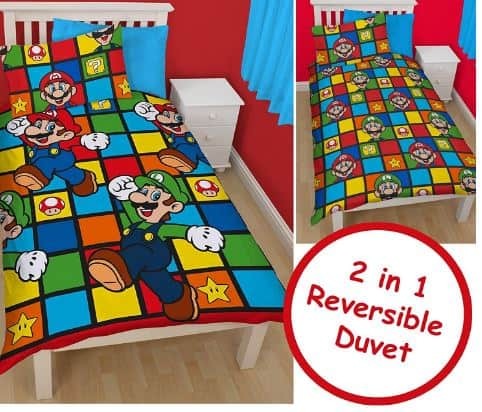 There are plenty of Mario bed sets available, but these are a couple of my favourites. both are also reversible, so there are two designs for the price of one. 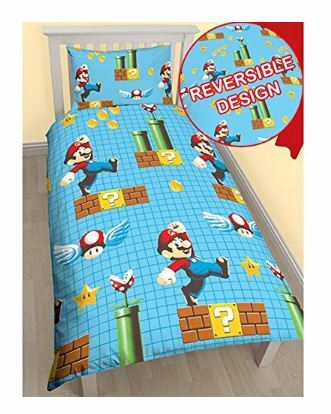 Check Available Mario Bed Sets Here! Creating this post has certainly made me feel nostalgic about Super Mario Bros. I spent so many hours playing Mario as a child – and now my kids love it too. I hope this post has given you plenty of ideas for creating your own Mario Bros bedroom! Is there anything I have missed out? 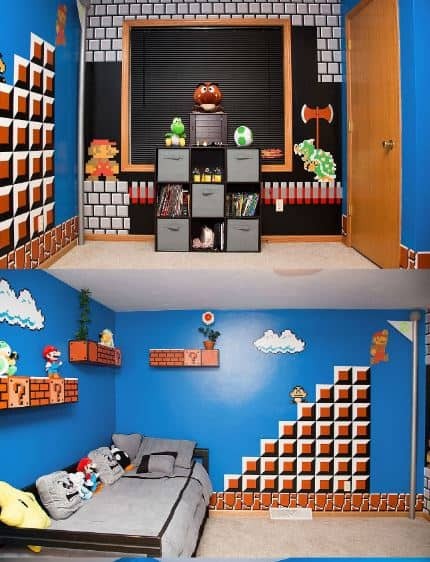 You have certainly put together some great bedroom theme ideas for Mario bros. Where do you get your ideas from? I reminded me of my childhood when my Mother surprised me with a Heidi-themed bedroom. I loved it with all the greens and flowers and a Heidi Duvet cover. I am sure any child regardless of whether or not they are into the games, would love to have bedrooms like the ones photographed on your site. A Heidi bedroom, that must have been lovely! Thanks for you comment – I get a load of my ideas via generally a google search, other bloggers and Pinterest! 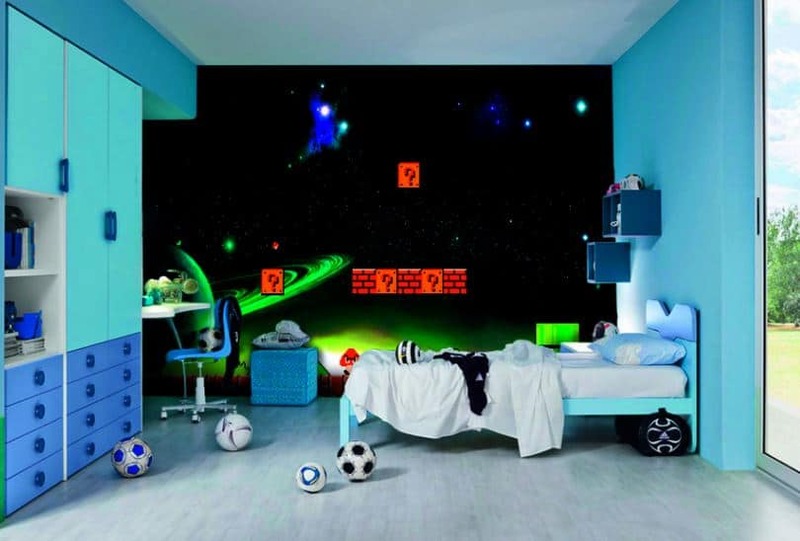 What a great collection on Super Mario bedroom decor schemes. Each one was better than the last! When it comes to kids’ bedrooms, the wall decals are absolutely brilliant. They can transform a room in a very short time – and they are so easy to apply. I’ve never used Super Mario ones (yet), but I recently put up some Spiderman ones and they worked like a charm. 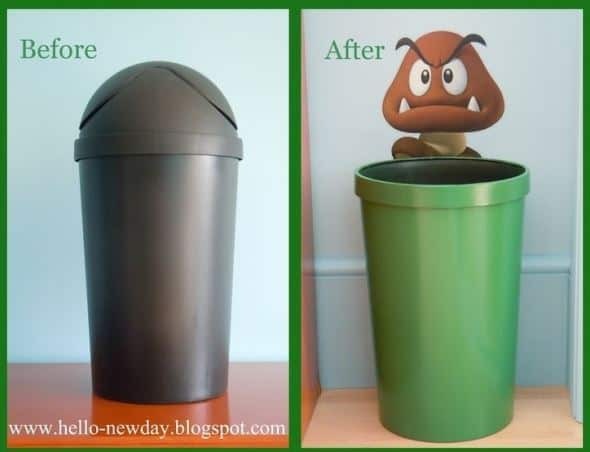 Maybe Super Mario will be the next makeover. Do you remember the paint colors that you used ? I love the blue sky- such a playful design for child.